Then the floor was formed. It had turn down of 2' (12" wide) on the three sides and a pad thickness of 6". It has 1/2 re-bar on 18" centers. I fabricated several chain tie downs and two large I beams, all of which were formed into the concrete. This will give me various options in the future. 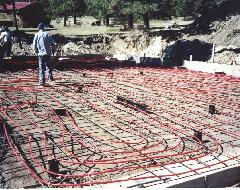 I also laid hydronic heating tubing in the floor for future use in heating the building. October 13, 1999. The floor and turndowns are poured. 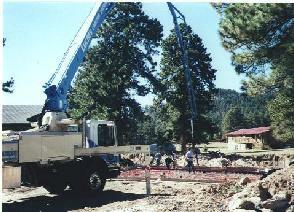 Because of the rebar and the hydronic tubing , we had to use a concrete pumper. The floor and turndowns took 52 yards of concrete. The total concrete for the project with the footer and columns was 72 yards!! November 27, 1999. The first beam is placed. I had built a 24 foot boom on the back of the motorhome (see next page for more information). The beams are fabricated in four parts. I assembled the parts and then raised the beam as one piece. I used a load spreader bar which was made of a 20 foot length of 6" channel. 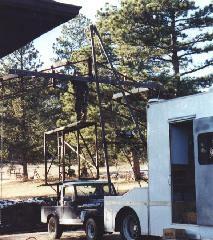 I also fabricated a 6' tall scaffold mounted to the Scrambler. That placed my feet about 12' off of the floor and I was able to reach most of the roof structure. Those of you who know me can relate to the fact that I emulate Tim Taylor (Tool Man) far too often. This held true on this project. During the assembly of the beams, I managed to drop the beam on a toe and fracture it in two places. Also managed to smash a finger as well. The clinic folks could only shake their heads! !